Russian-terrorist troops in Donbas continue actively shelling the positions of Ukrainian troops and [Ukrainian] settlements, using small arms as well as cannon artillery (122-mm and 152-mm), rocket artillery (multiple rocket launcher systems), armored vehicles, and mortars (82-mm and 120-mm). On several sections of the demarcation line, “small group” warfare continues; insurgents are laying minefields and conducting reconnaissance on the tactical and operational tactical levels, employing equipment, sabotage and reconnaissance groups, and other reconnaissance measures. In the vicinity of the Donetsk Airport (DAP), the settlements of Pisky, Avdiivka, Opytne, and north of Horlivka, terrorist shellings have become permanent. In the course of active fire strikes, insurgents are using, among others, 120-mm mortars and 122-mm artillery systems; in several instances over the past 24 hours, terrorists also used 152-mm artillery. North of Avdiivka (between the H20 and M04 motorways), insurgents continuously attempt to infiltrate the tactical rear of the ATO forces. Russian-terrorist infantry groups are making similar attempts north of Verkhnotoretske, along the Troitske – Novhorodske – Leninske line. Under cover of heavy mortar and small arms fire, insurgent groups use the greenery to approach ATO positions, either to infiltrate their rear or to open fire at close range. A terrorist armored group (three tanks and two BMP-2 infantry fighting vehicles) has been spotted south of Avdiivka (Opytne, Vodyane), while a second armored group (two tanks and two BTR-80 armored personnel carriers) is operating in the vicinity of Pisky. The armored groups are using their traditional tactic: a concealed and quick approach to the firing position, followed by shelling onto the positions of Ukrainian troops (usually 5-6 shots, sometimes 10 or more) and a similarly fast retreat, under cover of mortars or the accompanying ACVs. South of Donetsk, in the vicinity of Starohnativka, shelling from 152-mm artillery was reported. South of Pavlopil, terrorists used small arms [for shelling]. The situation remains tense on the Svitlodarsk bridgehead. A tactical insurgent group (total strength currently approximating two “motorized rifle battalions,” reinforced with a minimum of two tank companies) deployed in the Pervomaisk – Kirovsk – Stakhanov area is active across a wide stretch (from the settlement of Luhanske to Zolote and Katerynivka, including the area of Popasna), staging armed provocations that aim to make the ATO forces resort to heavy armaments. In particular, insurgents operating in this area, in addition to the “tanks + mortars” tandem, are actively using the greenery to approach the advanced ATO forces positions and open fire from small arms and mortars. In the same area, an insurgent artillery group has been spotted (stationed near Lomovatka), armed with 152-mm artillery guns (Msta-B howitzers or Akatsiya 2S3 self-propelled guns – information currently being clarified). Over the past 24 hours, this artillery group has repeatedly fired in the areas of Popasna, Luhanske, and Svitlodarsk (previously, insurgents in these areas mainly employed 120-mm mortars and “roving tanks”). In the areas of Krymske, Trokhizbenka, Novotoshkivka, and Sokilnyky, terrorists are employing rocket artillery – Grad-P 9P132 (“Partizan”) units. In the same area, the relocation of an insurgent unit operating a Grad BM-21 MLRS has been spotted. Over the past 24 hours, terrorists in this area also used 120-mm mortars and AGS-17 automatic grenade launchers. Firefights are virtually constant on the stretch between Novotoshkivka (checkpoint #29), Krymske, and Sokilnyky, as well as northwest of Donetsk. In the Petrovskyi district of Donetsk, the regrouping (rotation) of insurgent units is underway. Five tanks, two BMP-2 infantry fighting vehicles and one BMP-1 have been moved to the city center from the directions of Krasnohorivka and Pisky. An artillery unit (battery) of 122-mm D-30 howitzers was transferred to Horlivka. The guns were moved from the Yenakijeve direction with the help of Ural army trucks. The insurgents organized the delivery of food products from Russia through Krasnodon to Luhansk as a “substitute” for Ukrainian products, which terrorists were having trouble delivering from the unoccupied territory [of Ukraine] due to stricter pass controls in the ATO zone. The deliveries are controlled by Ihor Plotnitsky‘s “personal guard.” Food purchases from Russia are entirely financed by the “budget funds” of the “LNR” [Luhansk People’s Republic] (the “budget” is formed through Russia’s financial aid and “taxes”), however, the income from sales is collected by individuals in the “LNR” command. Essentially, the “LNR” leadership is profiteering on sales of Russian products without investing a kopeck of their own funds into organizing those sales. 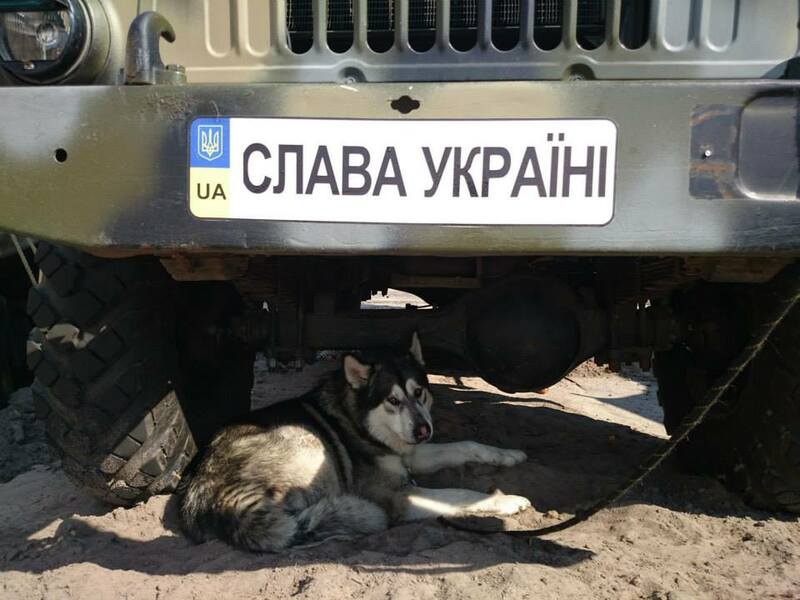 One of the guard dogs of Ukrainian soldiers. Photograph by MoD of Ukraine.